I cannot rave enough about the wonder that is pearl barley. It’s cheap (approximately 40p per 500g here in the UK), healthy, and filling, and I could personally devour its chewy goodness by the bucketload. If you’re looking for a new year alternative to your usual rice or pasta, I definitely recommend giving it a try – particularly in this warming, hearty winter stew. I’m a vegetarian, so I stirred through some Quorn chicken style pieces. However, I’m sure this would work just as well with the real thing. If you’re a meat eater, switch out the veg stock for chicken stock and stir through some bacon lardons for an extra salty, savoury touch. 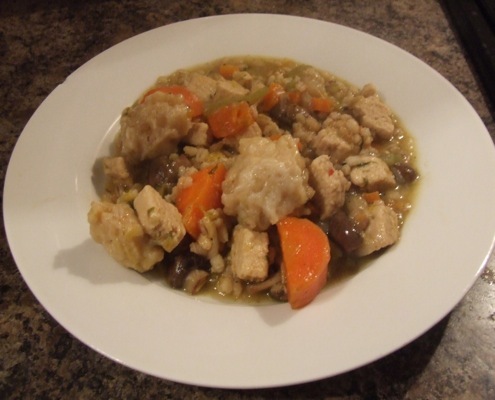 This entry was posted in Recipes and tagged celery, dumplings, garlic, leek, mushrooms, onion, pearl barley, Quorn, stew, suet, turnip, vegetables, white wine on January 8, 2013 by eleanor. It’s that time of year again when we all decide what we’re going to eat less of (chocolate, crisps, cookies… hey, I’m on the diet bandwagon with you and am practically drooling as I type). However, being the optimist that I am, I’ve decided to ditch the January blues and desperate sugar cravings and focus on the positive – foods that I can eat, will eat, and want to eat more of in 2013. These foods are all healthy, nutritious and when prepared properly, delicious, so I’m just as excited about them as I would be about a new new cake recipe. Okay, I’m lying, but help a brother out and pretend to get excited with me. This entry was posted in Food, Life and tagged bananas, chili, Jamie's Italian, Nandos, new year's resolutions, noodles, protein, Quorn, soup, vegetarianism, Wagamama on January 5, 2013 by eleanor.